What makes hundreds and thousands of football fans come to stadiums? What attracts them so intensively that they are ready to pay fantastic sums for the right to be at the play? Passion is the answer: pure passion, passion to football, to play and life. Such welcome football world cup is coming soon and passion is burning stronger every day. Even those who haven’t thought about tickets for this Cup 2018 wish to become a part of this world passion and have begun to get interested in prices for tickets. But hot passion costs much and amount of tickets is evaporating every single day, though prices at agent sites are coming to its climax. Sale of tickets for this spectacular event is done in three stages only at the official site of FIFA. At the present time starting from the 18th of April of 2018 the third stage has been going on. It will be completed by the 15th of July, 2018. Due to the fact that number of people willing to buy tickets is more that available tickets, FIFA has decided to spread tickets by random drawing procedure. People from all over the world applied for tickets from the 14th of September, 2017 to the 12th of October, 2017. To do this, one had to register at the official site of FIFA and had generated a request with indication of bank card data. In case of your request approval, money was withdrawn from your bank account and status of your request was changed. The first stage was completed from the 16th of November, 2017 to the 28th of November, 2017 when tickets were sold “first in first out” basis. While the second stage, requests were spread on a “lottery” basis from the 5th of December, 2017 to 31st of January, 2018, and time of request applying was not taken into account. Many people who were buying tickets online at that time noted unstable operation of FIFA platform and multiple difficulties arising while online buying. In spite of all difficulties arisen, it turned out that after completion of the 2nd stage half (47%) of tickets out of 1 698 049 was taken by the Russian fans. We may propose that major part of them was purchased by the Russian companies for further reselling. It is rather difficult to do it legally because all tickets are personalized. But as they say, nothing is impossible. Falk Eller, head of ticketing of FIFA, announced to the journalists that about 2,7 million of tickets will be sold. Easy math let us know that about one million of tickets was available by the beginning of the final stage of selling that comprises a little bit more that one third of the total number. 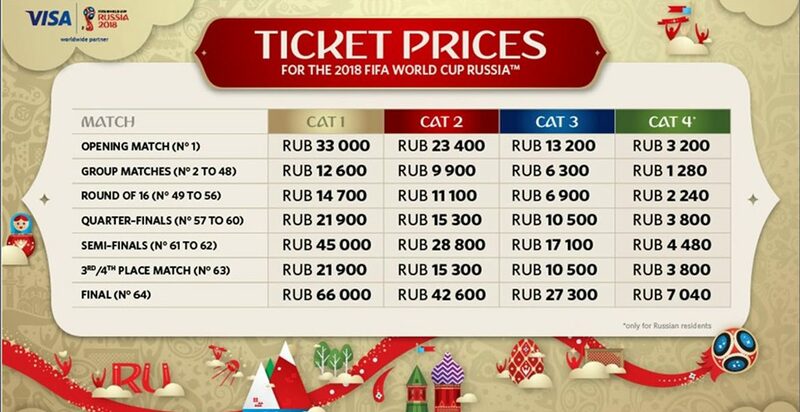 By the way, here is a table of prices in depending on ticket category and match round done by FIFA, the only authorized representative of ticket selling. It has become evident that it was quite possible to come to the stadium for enjoying matches of world class by reasonable prices. The fourth cheapest category of tickets was available only for citizens of Russia. Anticipating, we can tell that now these tickets cost approximately so: we add one “0” and multiply by 2 and get 25600 Russian rubles depending upon the value of the match. Prices for the fourth category that are available only for citizens of Russia are equal t0 18000-30000 Russian rubles at the agent sites. Demand for tickets is very high and continue to grow. It is still possible to apply a request by getting registered at FIFA official site and have a try to buy ticket online. There is no queue, not much time to wait and practically no tickets. But those who don’t lose faith and is rather lucky can hope for refusal tickets. As it was mentioned beforehand, all tickets are personalized and in case of force-major when somebody won’t be able to come to the stadium for a match, it is prohibited to sell them on your own, it can be done only through FIFA site. Buy one of Hospitality Packages at FIFA site Not many of them are available, but attractive options are possible with them such as separate entrance, more chances for convenient parking, as well as beer, snacks and even strong alcohol drinks in separate more comfortable zone depending on the package status. For example, package match Status is available starting from 595$, package match House Premier – from 695$, match Club – from 850$. These are the most available. Relatively average categories – match Pavilion – from 1650$, match Business – from 2650$, match Loge – from 3300$ and Deluxe Hospitality Packages such as Tsar Loge – from 10900$ and Private Loge – from 54750$. The tickets centers are also operated in the towns with Cup stadiums, their addresses and operating hours are available at FIFA site. Unfortunately, people preferring buying tickets as before and making a queue at the day of opening of these centers were left unsatisfied, there were tickets only for several matches and major part of them of the 1st category. These centers are designed first of all for issue of earlier spread tickers and for selling the tickets balance that is not sweeter the meat that time. Happy football fans that are members of the official football fan organization and having citizenship and/or living in the country of the national team to the matches of which they want to come, can buy non-fixed tickets. 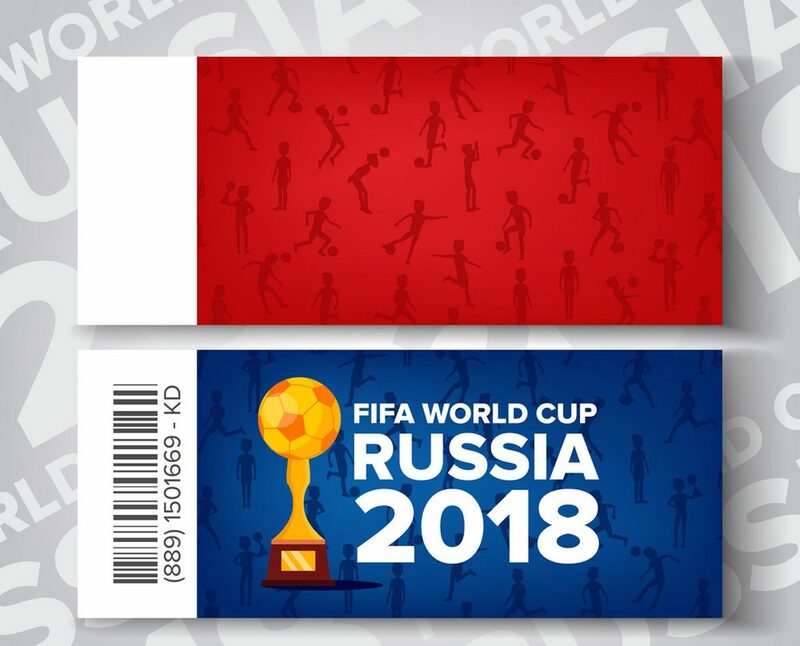 These tickets are given by FIFA to every team that participates in the World Football Cup 2018. Though tickets are sold only through official FIFA site and no other web site or the other Party has a right to sell tickets for the matches of World Football Cup 2018, there is a possibility to buy tickets at agent sites, but risks to buy a fake ticket is very high. Prices at such sites are different, some sites have reasonable prices (but it not a guarantee that you can come to the match by them), other have very expensive tickets. One should think twice and try to buy tickets at FIFA site or ticket centers before doing such a risk step. One person can accompany inactive people from above categories, including visually impaired ones free of charge but without guarantee that they can seat together. One can use such a possibility only if reference and proving documents are available which can be taken when buying tickets in official ticket centers and when coming to the matches with tickets bought online. Tickets for people with preferentials due to health are sold as tickets for the third category for foreign fans and as for tickets of 4th category for residents of the Russian Federation. When buying such tickets online and applying requests, just choose option “Show tickets for special category of citizens” at the stage “Choose the ticket”. And be attentive when reading rules and regulations when buying such tickets and don’t forget about proving documents. One more advice: taking into account that VISA is an official partner of FIFA, buy tickets with VISA cards. Well, you have just purchased a ticket and are a part of the world event, but there is one more obligatory condition – you should have a Fan passport (FAN ID). You can find all details at site www.fan-id.ru. This passport is done free of charge and gives you possibilities to come to the town where the match will be taken place and ease you greatly the procedure of the entrance to the stadium. Where to buy tickets for the 2018 World Cup? Tickets for the 2018 FIFA World Cup in Russia can be purchased online only on the official FIFA.com/ticket website. The rest of the online sources are illegal, including intermediaries, as stated on the FIFA website. During the last stage of sales in the cities of Russia will open official ticket centers FIFA. UPD: 08.02.2018 Presidential decree for the resale of tickets for the World Cup 2018 imposed fines. Are there special prices for Russians? Yes. There is a so-called “category 4” – this is a preferential price for residents of the Russian Federation. The cost of tickets of this category starts from 1280 rubles. In some matches, they will be more expensive. Tickets are sold only for a special sector, their number is limited. When and how tickets for the World Championship will be sold? 1st stage of sales (from September 14 to November 28 – completed!). The first stage of sales consists of two time periods with different conditions for ticket sales. September 14 – October 12. “Ticket sales” starts at 12:00 Moscow time. In fact, during this period will collect applications for the purchase of tickets. In this case, it does not matter what day you submitted it – that is, there is no priority for the former. FIFA has a certain quota for this stage, and if the demand exceeds the offer, the tickets will be played randomly among people with the same applications. The chances of all are equal. The application can be satisfied, partially satisfied or dissatisfied. All applicants will receive an answer (regardless of the outcome) until November 16, 2017. November 16-28. The second stage, where the real sale begins – according to the rules of the live order. What types of tickets can be purchased during the 1st stage of sales? Tickets for a specific match (any tournament game). Package for a specific stadium. You can buy tickets for a group of matches at the selected stadium. There are exceptions, so it’s better to get acquainted with the package system on the official website of FIFA. Packages for the national team. Suitable if you want to visit all matches of your team. Important: these packages are sold only at the 1st stage of sales. The number of matches (minimum three, maximum – seven) depends on how successful the team will be playing. After the official draw of the FIFA 2018 World Cup, which took place on December 1, 2017, the second stage of sales was opened. The rules for the second stage of ticket sales for the 2018 World Cup are similar to the first stage. 5 December – 31 January. During this period, the collection of applications took place then a random draw will pass. March 13 – April 3. The stage of ticket sales according to the rules of the live turn. Tickets purchased during the 1st and 2nd stages of sales will be delivered to the owners free of charge within a few weeks before the start of the tournament. The delivery of tickets will begin no earlier than April / May 2018 (changes are possible). The last opportunity to purchase tickets for the matches will appear in the fans during the “last minute” sales segment when tickets will be sold on a first-come-first-served basis. This stage will begin on April 18 and finish on July 15, 2018, on the day of the final match of the FIFA 2018 World Cup. Do not be embarrassed that tickets will be sold until the last day of the tournament, inclusive. Some categories of tickets (especially the most expensive) for FIFA probably remain. In the period of sales “at the last minute” there will also be a live turnaround rule. How much do the 2018 World Cup tickets cost? Citizenship (for residents of the Russian Federation there are benefits, but the number of such places is limited). Discounts for tickets for children are not provided. Tickets for a special category of persons? FIFA allocates special tickets for fans with disabilities, low mobility persons, and fans with excess weight. When will I get tickets for my hands? Tickets are delivered to their owners in the period of several weeks before the start of the World Cup. It is reported that deliver tickets will not begin earlier than April / May. Do I need to register a Passport fan? Yes, the passport of the fan FAN ID is a prerequisite for the passage to the stadium and the opportunity to take advantage of free travel. Before you make out, you need to receive a confirmation of the purchase of tickets.